Easy Pork Tacos - Home. Made. Interest. Pork tenderloin and fresh ingredients make these easy Pork Tacos a great back-to-school dinner recipe for busy weeknights! Can you believe that it’s almost time for school to start again? Where did the summer go!? Things are already gearing up around here. 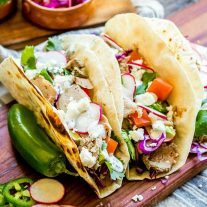 The kids are getting registered for sports, we’ve already done our back-to-school shopping and I’ve been working on making a list of some of my favorite easy recipes, like these easy Pork Tacos, so I can make sure my pantry and fridge are stocked with everything I need to cook dinner in a hurry. My rule is all of the recipes have to be something you can make in 30 minutes or less. I know from experience that once school is back in session and the kids’ start up again that’s about how long I have to get dinner on the table on a school night. This easy recipe for Pork Tacos starts with a marinated pork tenderloin. Like I said, this recipe is all about keeping it simple and making a great dinner in under 30 minutes so I use Smithfield Marinated Fresh Pork. It is made from 100% fresh pork with no artificial ingredients and comes in a variety of fresh cuts and marinades so it’s a perfect fit for all types of recipes. It’s a great way to make a dish with real flavor, real fast. For my Pork Tacos recipe I usually pick up Smithfield Marinated Fresh Roasted Garlic & Cracked Black Peppercorn Pork Tenderloin from the fresh meat section at Safeway. I also pick up flour tortillas and fresh ingredients for the toppings. I am able to get everything I need on my weekly trip to Safeway. To make my Pork Tacos I cook the Smithfield Marinated Fresh Roasted Garlic & Cracked Black Peppercorn Pork Tenderloin in the oven for about 30 minutes (or until it reaches an internal temperature of 145 degrees F.). While it is in the oven I get my toppings ready. The fresh toppings for the pork tacos can be anything you want. I like to add a little crunch and color with some thinly sliced radishes and maybe some red cabbage. tomatoes, jalapeños, avocado, roasted corn, and maybe a little cilantro to add some fresh flavors. Oh! And of course, cheese! I like fresh queso blanco but my kids love shredded cheddar. I think that’s what makes these pork tacos a family favorite since everyone can make their taco just the way they like it. 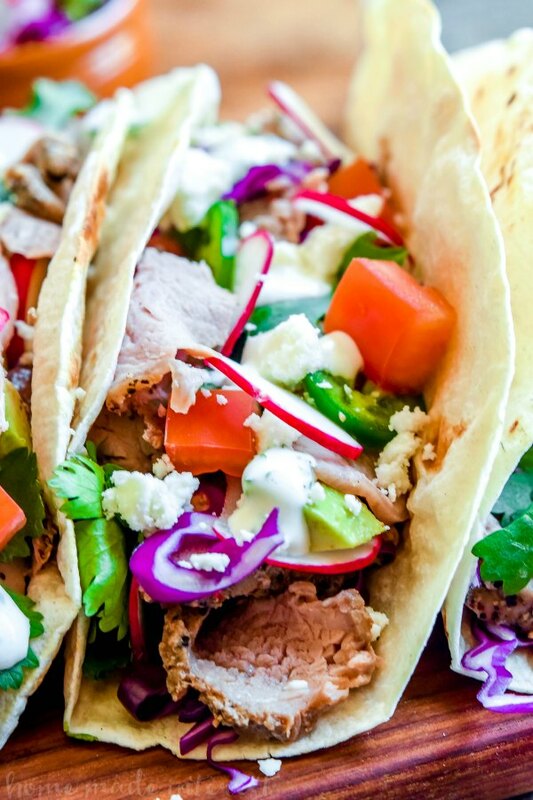 The final component for these easy pork tacos is a simple homemade Garlic Ranch Dressing. Everything is better with ranch dressing and these tacos are no exception. The bold flavors of the dressing are a quick and easy way to add a little punch to the tacos really fast! 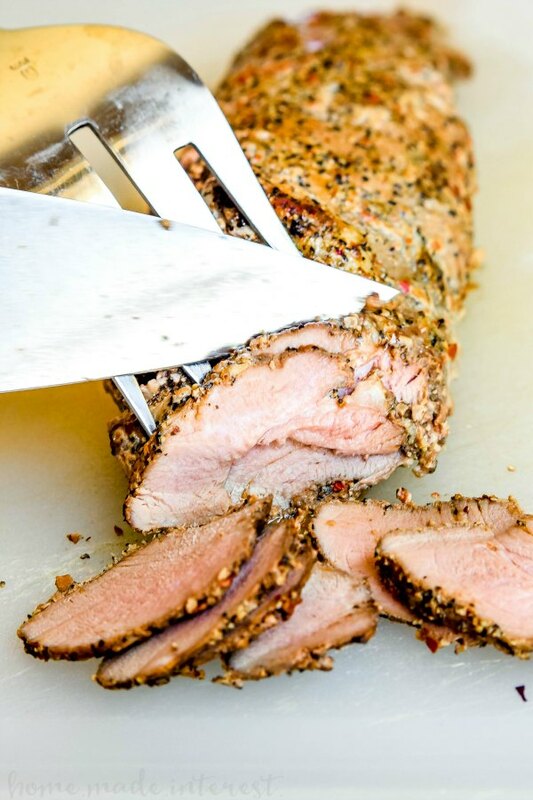 I thinly slice my perfectly cooked Smithfield Roasted Garlic & Cracked Black Peppercorn Pork Tenderloin and place the tender pork on a flour tortilla, then I top it with fresh vegetables and herbs and a delicious drizzle of Garlic Ranch Dressing. Yum!! It’s a 30 minute meal that the whole family loves (and I even have leftover pork for my lunch the next day!). Now you know one of my tricks to getting a delicious dinner on the table in under 30 minutes. 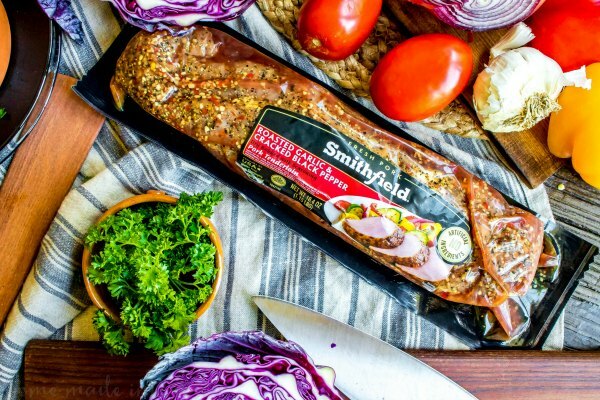 Smithfield is also challenging you to submit your tips on how you get dinner ready in 30 minutes or less using Smithfield Marinated Fresh Pork and you will be entered to win the grand prize! For more 30-minute meal preparation ideas, and to submit your original recipe for a chance to win great prizes, head to www.SmithfieldRealFlavorRealFast.com. Grease a baking dish and place the tenderloin in it. Bake for 28-30 minutes or until internal temp is 145 degrees F.
Let pork rest for 5-10 minutes and then thinly slice. 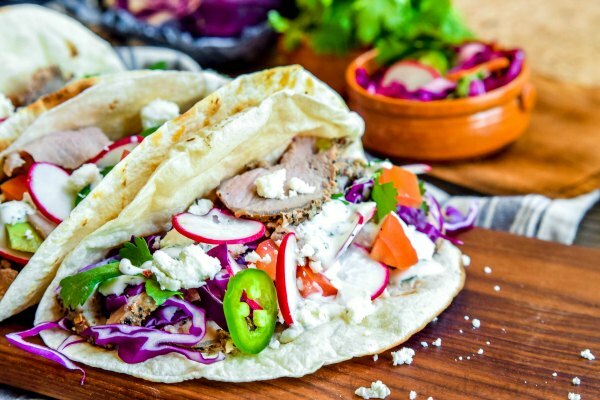 Assemble pork tacos placing pork and your favorite toppings on flour tortillas. Top with garlic ranch dressing. Mix all ingredients in a small bowl until fully combined.